As concerned parents we summarise the main reasons we believe a move to Chorlton High School becoming an academy would not be in the best interests of our children, future pupils and the local community. 1. If it is not broken why fix it? We have an excellent school, with fine facilities, hard working staff and good leadership. Our school has good results and good links with feeder primaries. The Tory Education Secretary, Michael Gove is in a hurry to push successful schools like Chorlton High into converting to Academies. 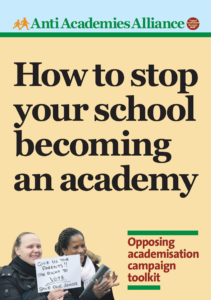 No longer funded through the elected Local Education Authority, Academies are funded directly from the department in London and are accountable to the department in London. Converting to an Academy would bring no financial gain to the school. It would, though, fundamentally change the way in which the school is run. Forever. Out would go the elected Governing Body. In would come an Academy Trust of four, selected from an approved list drawn up by Gove’s department. The Trust would then construct a new Governing Body, which might include parents and even local Councillors. They would advise the Trust on how they believe the school should be run, but in the end The Trust makes the final decisions. The Trust is not elected. It is not accountable to parents or the community. If things went wrong, neither parents nor the local Council would have the power to put things right. Academy Schools are different. They do not have to employ qualified teachers or trained headteachers and some heads of academies can find they are less important than ‘business managers’. In the short term that is unlikely to affect a school like ours, but many of Michael Gove’s advisers think that ‘for-profit’ providers should be allowed to run schools. No one involved with Chorlton High School wants that and if the school stays as it is, no company can take the school over. It could not become a school run for profit. 4. Keep it local. Keep it inclusive. Our school is inclusive for all pupils from our catchment area. Regardless of background or ability, pupils can gain a place at our school. The school has good links to the feeder primaries. An Academy school has greater powers to change the admissions criteria. Pressures to compete in the ‘market for league table results’ have affected the intakes of pupils in Academy schools. 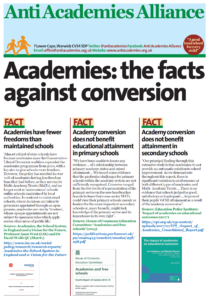 Whatever the aspirations and values of the current staff, the facts show that in Academies there is pressure to alter the pupil population to improve results. If the school becomes an Academy, then there will be less money in the Local Education Authority, which translates to less money for our local primary schools, too. Future links to local primaries would be determined by the future business interests of the Trust, not by the needs of local parents, and on the advice of local headteachers. Manchester primary schools currently are virtually all, like Chorlton High School, part of the Local Education Authority. All the teacher trades unions, the NUT, Nasuwt, and the ATL, as well as the staff unions Unison, UNITE and the GMB, are opposed to Academies. At the last teachers’ union meeting at the school, staff voted overwhelmingly to oppose becoming an Academy. The latest findings show that, when comparing like for like, Academy schools get lower exam results than those that have chosen not to become Academies. We have confidence in and respect for th current headteacher, Andy Park, who is committed to keeping the ethos of the school. But, if Chorlton High converts to an Academy, everything could change in the future. Andy Park might be the last teacher with commitment to all of our children to lead the school. 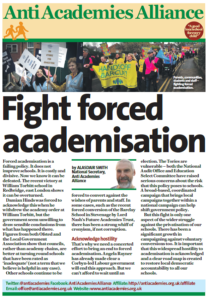 Come to the Anti-Academies Alliance Meeting Thursday 8th March 7pm The Dining Hall, Chorlton High School. Everyone, including primary school parents, will be welcome. This entry was posted in News and tagged Parents. Bookmark the permalink. It is possible to write the articles of association such that only governors can be members and limit the number of governors that members can appoint (we tried for none but got a limit of one past DfE). We have a governing body of 20: 7 elected parents, 3 elected staff, 6 representing community groups and the rest appointed. Its not perfect. No to academies would be better but it is possible to mitigate against the most undemocratic aspects of academisation. Your governing body will be taken over by hand selected governors. There will be no more democracy. Our ‘academy governing body’ has been stacked with apparatchiks. There are only 2 elected parent governors out of 20 governors. Headteacher is governor. The other 17? How are they elected/appointed? Who knows. Complete oligarchy. Can’t get anything accomplished. Forget about ever complaining again. If you can manage anything, get them to put in section 58b of Annex A, standard template. This would make the parent and staff governors the same number and the same expiry to their terms in the next body. But it wouldn’t prevent the body from appointing additional numbers until you had no power again. You would have to get them to agree to the numbers and make-up. You won’t stop them being an academy. But you might get some agreements about numbers, too. Make it happen. I absolutely agree with the points made above. We need as local parents to ensure we battle this philosophical neo liberal attack and ensure that Chorlton High school reflects what we the local community and our children value. The great things about Chorlton High utterly contradict the model proposed by Gove et al.